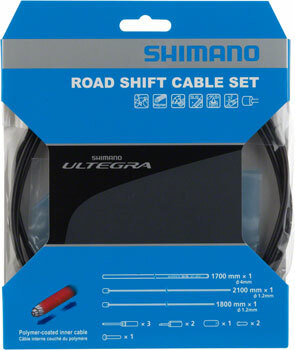 Shimano Ultegra OT-SP41 Housing & Polymer Cable Derailleur Sets include Polymer-coated, stainless steel inner cable reduces the sliding resistance to achieve lighter and quicker operation and is rust resistant. OT-SP41 Housing is pre-lubricated with silicone grease. Sealed end caps to minimize dirt contamination. Low friction polymer material on the cable may cause slippage at the cable fixing bolt after initial pre-stretch for the cable is performed.